What happens at a service? The Parish of Central Exeter strives to be an open, welcoming Christian community exploring the meaning of faith today, through worship and prayer, discussion and reflection, and action in the City and where we live and work. 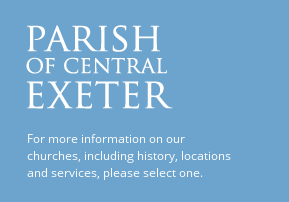 This website gives details of the churches within the Parish of Central Exeter, including locations, brief histories and service times. Please click on Contact Us for details on how to contact key people within the parish.